Levine in 2016 (file photo). BRITISH SPRINTER NIGEL Levine has been provisionally suspended after failing a drugs test, UK Athletics have announced today. It was reported in December that the 28-year-old had allegedly tested positive for the banned asthma drug clenbuterol. The European 4×400 metres gold medallist, who was born in born in Trinidad and Tobago, failed the test while attempting to come back from career-threatening injuries suffered in a motorbike accident in Tenerife last January. 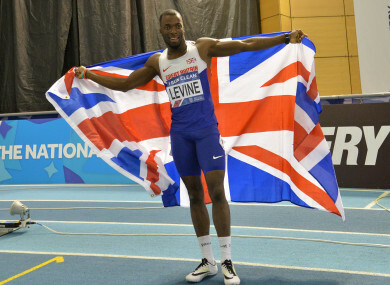 “UK Athletics has today announced that athlete Nigel Levine has been provisionally suspended from participating in athletics after being charged with having committed an anti-doping rule violation contrary to IAAF anti-doping rule article 2.1 (presence of a prohibited substance or its metabolites or markers in an athlete’s sample),” said a statement from UK Athletics. “The provisional suspension was issued by UK Anti-Doping and is in accordance with IAAF anti-doping rules. Email “British Olympic sprinter suspended for failing drugs test on comeback from motorbike accident”. Feedback on “British Olympic sprinter suspended for failing drugs test on comeback from motorbike accident”.